For the past couple of weeks, I’ve basically been a single parent with no help. My husband has been traveling long and far for work and my nanny is off on a much-deserved vacation to see her family and friends back home. As a result, I’ve been holding up the household, trying to cook, write, blog and keep my “spirited” two year old entertained and in check. Don’t get me wrong, we’ve had a great time. While not having childcare during the day has forced me to work at night, early morning and during naps, it has also given me an excuse to go to the beach on a Tuesday. While I’m physically and mentally exhausted, I can’t tell you how liberating that is. I’m so incredibly thankful to be able to have command over my own schedule and call the shots on projects, despite working all those odd hours. Meals this week have been more of challenge, since I don’t really have another hand to help out while I’m cooking dinner. (To all the actual single mamas: I salute you). So, I’ve been turning to those easy, 30-minute or less weeknight dinners that I know will turn out well and are healthy and filling, to boot. This one is adapted from a recipe I learned from my mother in law called kheema. It’s basically spiced minced meat. It’s simple, fast and, no matter the iteration, always tastes fresh and delicious. She usually makes with chicken. I’ve made it with almost every meat imaginable, and lamb is one of my favorites. If you’re not a lamb fan, you can also make it with chicken (a combination of minced white and dark meat works best). Because I want this one to be as fast and easy as possible, I use ground spices. However, if you want to intensify the flavors, use whole spices that you toast and grind before adding to the pan. 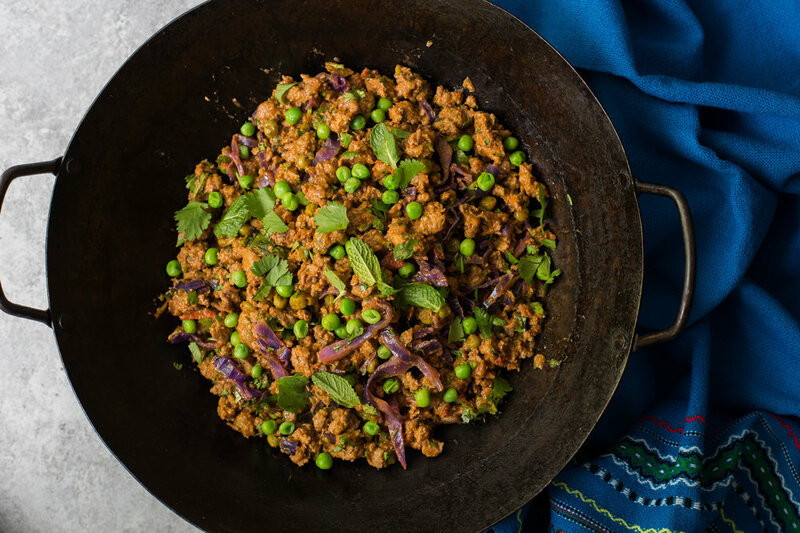 Inspired by a spiced minced meat recipe that my mother-in-law taught me known as kheema, this 30-minute meal pairs ground lamb with a flavor bomb of spices, fresh herbs and lime. You can really use any kind of minced meat for this dish. The flavor is all in the spices and the fresh herbs. You could even make it vegetarians by trying it with something like minced tofu or cauliflower rice (let me know if you do). It can also be modified to use any vegetable. You could try red bell peppers or potatoes. Just keep the main protein and spice ratios in check. In a large skillet over medium heat, warm the coconut oil. Add the onion and cook until slightly soft and translucent, 5 to 7 minutes. Stir in the garlic, ginger, coriander, cumin, fenugreek and chili powder and cook until fragrant, about 30 seconds. Add the minced lamb and a pinch of salt and stir with a wooden spoon to break apart meat and incorporate spices. Cook until the lamb is golden brown, 6 to 8 minutes. Add the tomatoes, red cabbage and a pinch of salt to skillet and cook until most of the liquid from tomatoes has evaporated and tomatoes are cooked through, 5 to 7 minutes. Add the peas and garam masala and cook for another minutes. Then stir in the cilantro, mint and juice of half the lime. Season to taste with salt, to taste. Divide evenly between two bowls and eat on its own or with your choice of flat bread. Garnish with the extra lime.